On just one December day in San Francisco, a man named Caseilli was arrested for a hit and run of three children (“I didn’t think they were badly hurt and they were picked up, so I went on”). A man named Roy Burton was charged with hitting a pedestrian (at least he gave the victim a ride part of the way home, dropping him off within two blocks). Louis Kantor was arrested as the suspect of a joy ride that killed a bank teller and the driver of an “auto hearse” ran down a four year-old. The child was not seriously hurt but that fellow should be cheered for stopping at all, although it may have been to check whether he had a new customer to ride in the back. It was a serious issue not being treated very seriously by the state, which still regarded a car as horse-and-buggy version 2.0. At the time the entire section of California law related to automobiles was only 19 short paragraphs and could easily fit on a pocket-sized card. All auto accidents were classified misdemeanors and as for hitting someone, the law stated: “In case of accident or injury to person or property car must stop and if requested, give name of owner” (emphasis mine). There was no requirement to help the victim or mention of what was required if the person was unconscious – or dead. At least the law did say the driver and/or owner of the car could be sued for injuries or property damage, but a couple of earlier high-profile local accidents demonstrated how well that worked out – or didn’t. In late 1910 a Sebastopol farmer named Walter Elphick was driving a car at night on the road from Santa Rosa to Penngrove. (Before you ask, Elphick Road in Sebastopol is apparently named after his father Henry.) He hit the buggy of David Batchelor, who had a real estate and insurance office in Penngrove. Batchelor was thrown 25 feet from the buggy. His horse broke free as the car shoved the buggy 50 feet back. Elphick lied about his identity (he said his name was Jones and he was headed to Cloverdale) but Batchelor noted the license number on the car. Bachelor sued for $3,000 damages. At the jury trial Bachelor testified that the car was on the wrong side of the road and going over 40 MPH (this was 1910 and country roads were not paved). Elphick said he tried to stop but his tires skidded. As for the fake name, he claimed he didn’t really remember that clearly, but he lied to “avoid publicity.” The jury awarded Bachelor $700, which was about what the average family earned for a year. But the matter still wasn’t settled because: Lawyers. Five months later, Elphick asked for a new trial. His lawyer was this journal’s anti-hero James Wyatt Oates who built (what would become known as) Comstock House. A young apple farmer wouldn’t normally be able to hire the top lawyer around, but Oates was a fanatical car nut who had just ended two terms as president of the Sonoma County Automobile Association, and likely took on the case gratis. Elphick now claimed “the accident was unavoidable and that Batchelor was not thrown from his buggy at the time of the impact, but was thrown later when his horse became unmanageable,” according to the Press Democrat. After seven hours of deliberation, the jury knocked the award down to $125. The other notable accident happened in 1911 when Sloan Boyd, a young man who lived in Rincon Valley, was hit while riding his bicycle home from work at night. This time the victim’s injuries were quite serious; he was hospitalized for six weeks and “for several days he was delirious and it was not thought he would live,” reported the Republican. The PD showed great interest in the case and offered regular updates on Boyd’s improving condition but curiously, never mentioned who was responsible except for the initial story declaring it was “a San Francisco man.” But even that was wrong; he was Samuel Stitt, the manager of a significant Los Angeles bank and the car belonged to his fiancée Hazel Farmer, a member of Santa Rosa’s elite society. The daughter of Dorothy Farmer (think Farmers Lane), Hazel and her mother were as crazy about cars as Wyatt Oates and both were part of the Oates’ small circle of friends. In 1909 Dorothy had purchased a Packard in Los Angeles and she and Hazel drove all the way back to Santa Rosa – no easy feat since those primitive automobiles broke down regularly and most roads between towns were horse trails. Both were often featured in the Press Democrat for their motoring adventures around the state. Sloan Boyd was well compensated for having been hit by an heiress, while David Batchelor probably didn’t have enough left over after paying his attorney to buy a new buggy wheel. But the bigger picture is that both were totally on their own after being run over; there was no requirement for car insurance (the first ads for it didn’t appear in the Press Democrat until 1916) and no expectation the police would investigate whether or not the driver was driving dangerously. Meanwhile, every year the new cars were bigger, heavier and faster – and there were lots more of them; by the spring of 1913, California had over 100,000 registered cars. That worked out to about one per every 25 residents, and you can bet more people than just car owners were driving them. Few had any kind of insurance and none were expected to pass even the most minimal driving test, as there was no license required to drive. What would you expect the outcome to be? 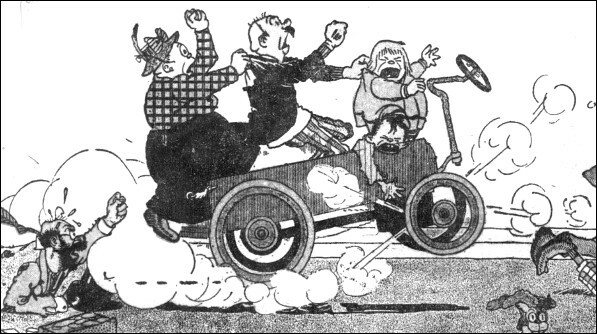 Always a good reflection of popular culture, nearly every Sunday the funnies found in city papers would have at least one cartoon showing some hapless soul losing control of a car and crashing. There was also “Motorcycle Mike,” a popular comic strip where the whole gag was a reckless guy riding around accidentally causing random destruction and sending people flying. 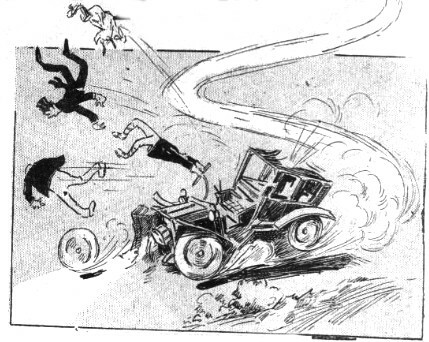 By 1913 there was also a new disturbing trend: Hit and run accidents. “Hit and run” was not yet a common term in 1913, but Google offers an “Ngram Viewer” that scans all 30 million items in Google Books (which includes many magazines and journals) for words or phrases, and for the first two decades of the 20th century it shows a spike nationally around that year for accident-related terms such as, “hit by an automobile,” run over by an automobile” and yes, “hit and run.” From then onward, phrases like these climb sharply in use. Locally there were at least three serious hit and run incidents in 1913. In Santa Rosa a man on a motorcycle was run down on Mendocino avenue near Cherry street and a bicyclist was knocked unconscious on Santa Rosa avenue. Those drivers apparently were not caught, but a Napa man named Oscar Godwin was arrested for rear-ending at high speed a buggy on the road to St. Helena, where two young women were thrown to the ground. Godwin’s excuse for not stopping was that his passengers forced him to keep going. Clearly, something had to be done. Lacking a workable set of rules of the road from the state, local jurisdictions were stepping in to set their own basic laws, such as Santa Rosa requiring tail lights and drivers to keep to the right side of the street (see “DRIVING LIKE A SANTA ROSAN“). Finally, the legislature revamped the entire section of code with the Vehicle Act of 1913. The new state code was comprehensive – far too comprehensive to the likes of many. 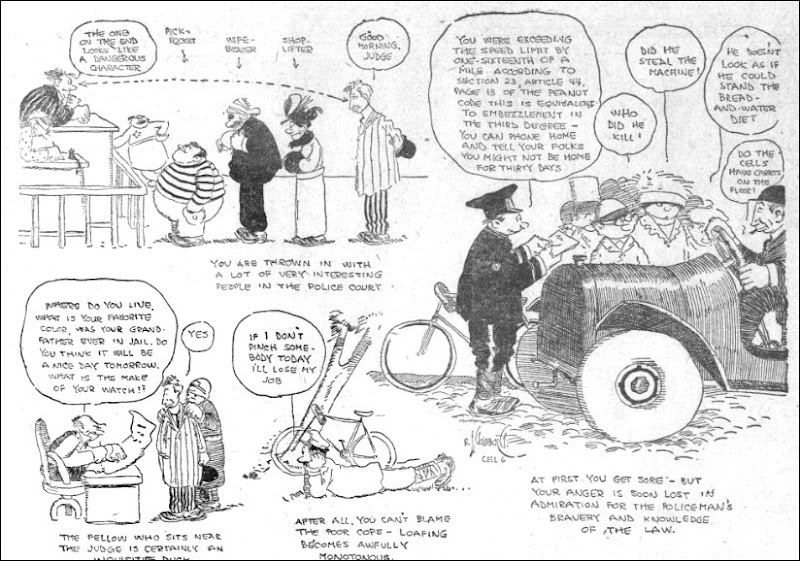 Drivers had chafed even under the old laws and griped they were being picked upon; the great cartoonist Rube Goldberg earlier had produced a cartoon for the San Francisco Call satirizing a tortuous visit to police court for a speeding ticket (the harassed driver looks suspiciously like Rube himself, BTW). Little, if anything, in the 1913 law seems controversial today. No street racing was allowed without a permit, no drunk driving, joyriding was illegal without the owner’s permission and no one under the age of 16 could drive, for ex. Addressing hit and run, §367c of the new law finally required the driver to not only stop but provide help, while making it a felony to flee the scene. But there were loud complaints that even those changes were overreach and an affront to liberty itself. A superior court judge in San Bernardino had declared all these rules were “discrimination” against drivers because similar restrictions weren’t placed on people using horses. Even providing your name at the scene of an accident was unconstitutional, that judge said, because it could be self-incriminating – and again, not at all required if you were behind a horse. Because of this absurdly strict interpretation, hit and run was knocked down from a felony back to being a misdemeanor. The rollicking statewide fight over the California Vehicle Act of 1913 would be a fun article to write (my god, the passion!) but not for here. I’ll close by adding there was even a squabble over the new requirement for an “automobile warning signal.” Every vehicle had to have a signaling device “capable of emitting an abrupt sound, adequate in quality and volume to give warning of the approach of such vehicle.” Further, it was illegal to use the signals “for any purpose except as warnings of danger.” In other words: A horn. Batchelor testified that at the time of the colllson he was on the right side of the road and the automobile driven by the defendant was on the wrong side of the road. He testified that the machine was being driven at a rate of not less than forty miles an hour. He testified that Elphick gave his name as “Jones,” and said he was going to Cloverdale. Batchelor said he took the number of the machine and by this means learned the identity of the owner of the automobile. He testified that he was injured on the arm and shoulder and also suffered from shock. H. A. Atkinson testified as to Batchelor’s having come to his office two weeks after the accident, nursing his arm and in a nervous condition. Geo. Vogt was another witness. At a few minutes to five o’clock an adjournment was taken until nine o’clock Friday morning. Judge S, K. Dougherty, counsel for Mr. Batchelor, stated that he had one more witness he expected to call before resting the case. Colonel James W. Oates represents Mr. Elphick, and he will call some witnesses. The case will probably go to the jury today. In an opinion received yesterday from Judge A. J. Buckles of Solano county, a new trial is granted in the case of D. W. Bachelor against W. R. Elphlck. This sets aside a judgment for $700 granted the plaintiff in the first trial, which was heard by Judge Buckles, sitting in this county. The action was for $3,000 damages for a collision between Batchelor’s buggy and Elphick’s automobile. It was alleged in the complaint that Elphick’s automobile ran up behind the buggy and collided with it, injuring both the vehicle and the plaintiff. The plaintiff is represented by Attorney S. K. Dougherty, and the defendant by Attorney James W. Oates. …Elphick took the stand in his own behalf at the trial on Wednesday and he alleged that the accident was unavoidable and that Batchelor was not thrown from his buggy at the time of the impact, but was thrown later when his horse became unmanageable. He went pretty thoroughly into his contention before he left the stand on direct and cross-examination. This measure sets forth rules of the road; makes joy-riding, where the consent of the owner has not been obtained, a felony; provides that minors under 16 years shall not be licensed; fixes the speed limit at thirty-five miles an hour; prohibits intoxicated persons from driving an automobile or a motorcycle, and provides that “muffler cutouts” shall not be used within any incorporated city or city and county. All fees or other moneys collected by the State Treasurer shall be placed in a fund known as “the “motor vehicle fund,” and one-half of the receipts shall be returned to the Counties from which they were received, and these funds shall be paid into the road funds of the counties receiving them. San Francisco shall, under the provisions of the act, be deemed a county. Fines collected in the counties shall be paid into the county treasury, and placed in the “county good roads fund.” Applications for licenses shall be made to the State Engineer, and the licenses shall be issued by him, the money for the same to be paid to the State Treasurer, thus providing a double check on the business. Oscar Godwin, an auto proprietor and driver of Napa, is alleged to have collided with another vehicle near St. Helena last week–also with the new law which makes a crime of the neglect to stop and render assistance in the case of an automobile accident. I wonder how new reckless driving really when the automobile age began. I have relatives who were killed during horse and buggy accidents. Speeding horse and bumpy roads, such as they were, must have resulted in many accidents and injuries. An interesting question. I’ve certainly read often about buggy/trap accidents in the old papers and injuries were common, but I don’t recall any fatalities (some horses killed, tho). It would be a devilish topic to research, but using “runaway horse” as a proxy, the ngram viewer found American usage of that term peaked in 1913 – the same year targeted in this article on reckless auto driving. We can get an idea of how often that happened in a small town during the pre-automotive age because we have searchable copies of most years of the Petaluma Argus 1867-1891, and it averaged out to about nine runaway horses per year. None of the horsey accidents were hit and run, however, and as mentioned in the article, that kind of incident became so common from the 1910s onward we invented that term for it.